It’s time for a new survey! The details of the last survey can be found here. And the results can be found here. I posted a few weeks back asking for suggestions for questions to include on the survey. As much as we’d like to include more of them, we all know what happens when we have too many questions. The following graph is from the last survey. People answer fewer questions as we approach the end. They also skip tricky questions. The least answered question on the last survey was - “what is your favourite lw post, provide a link”. Which I assume was mostly skipped for the amount of effort required either in generating a favourite or in finding a link to it. The second most skipped questions were the digit-ratio questions which require more work, (get out a ruler and measure) compared to the others. This is unsurprising. This year’s survey is almost the same size as the last one (though just a wee bit smaller). Preliminary estimates suggest you should put aside 25 minutes to take the survey, however you can pause at any time and come back to the survey when you have more time. If you’re interested in helping process the survey data please speak up either in a comment or a PM. We’re focusing this year particularly on getting a glimpse of the size and shape of the LessWrong diaspora. With that in mind; if possible - please make sure that your friends (who might be less connected but still hang around in associated circles) get a chance to see that the survey exists; and if you’re up to it - encourage them to fill out a copy of the survey. The survey is hosted and managed by the team at FortForecast, you’ll be hearing more from them soon. 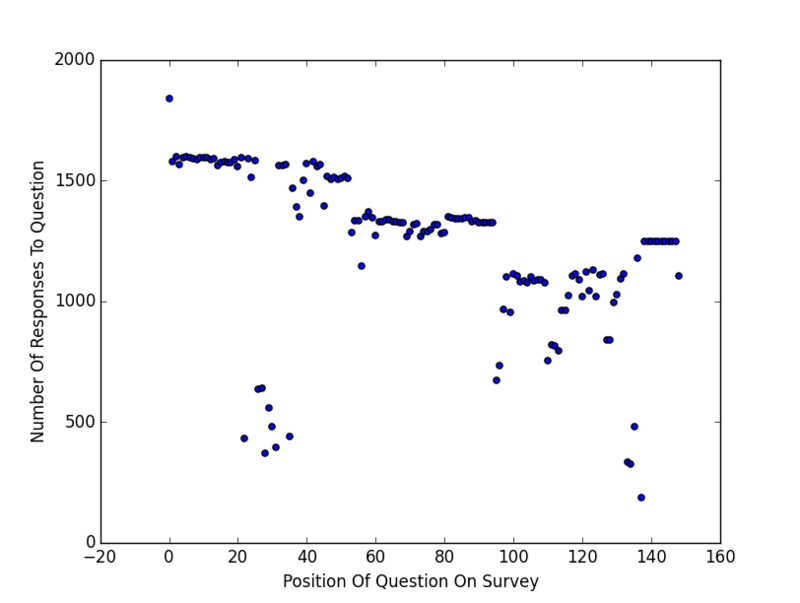 The survey can be accessed through http://lesswrong.com/2016survey. Survey responses are anonymous in that you’re not asked for your name. At the end we plan to do an opt-in public dump of the data. Before publication the row order will be scrambled, datestamps, IP addresses and any other non-survey question information will be stripped, and certain questions which are marked private such as the (optional) sign up for our mailing list will not be included. It helps the most if you say yes but we can understand if you don’t. Thanks to Namespace (JD) and the FortForecast team, the Slack, the #lesswrong IRC on freenode, and everyone else who offered help in putting the survey together, special thanks to Scott Alexander whose 2014 survey was the foundation for this one. When answering the survey, I ask you be helpful with the format of your answers if you want them to be useful. For example if a question asks for an number, please reply with “4” not “four”. Going by the last survey we may very well get thousands of responses and cleaning them all by hand will cost a fortune on mechanical turk. (And that’s for the ones we can put on mechanical turk!) Thanks for your consideration. Refresh the survey, it will still be broken. You should see a screen with question titles but no questions. Press the “Exit and clear survey” button, this will reset your survey responses and allow you to try again fresh. Rinse and repeat until you manage to successfully answer the first two questions and move on. It usually doesn’t take more than one or two tries. We haven’t received reports of the bug occurring past this stage. If you encounter this please mail jd@fortforecast.com with details. Screenshots would be appreciated but if you don’t have the time just copy and paste the error message you get into the email. Meta - this took 2 hours to write and was reviewed by the slack. My Table of contents can be found here.